The Archos G9 tablets coming in an 8-inch and 10.1-inch variety are a good option for budget-driven buyers and with the new turbo editions of both slates you get better hardware performance and the latest of Android for an even better value for your money . 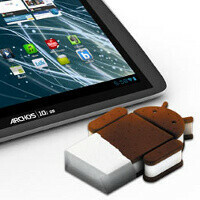 The Arhos 80 G9 is the 8-inch tablet and it features a TI OMAP 4 dual-core processor with each of the cores clocked at 1.5GHz. It runs on Android 4.0 Ice Cream Sandwich. The 8-inch capacitive display features a resolution of 1024x768 pixels. You also get full access to Google Play, the app catalog that is so often absent from cheaper Android tablets. Rounding up the package you have a front-facing camera for video conferencing, HDMI output, Wi-Fi and Bluetooth 2.1. All of that comes with the pretty affordable price tag of $269 with no contract commitment required. The Archos 101 G9 is a similarly stuffed solution but with a larger 10.1-inch display boasting a resolution of 1280x800 pixels. In its basic 8GB version, the tablet costs $329.99. Both tablets offer the option of the whopping 250GB of storage. Stuffing so much memory inside a tablet is amazing enough, but you’d need to swallow a higher price - $369 for the 8-inch G9 and $389 for the 10.1-inch version. You can get them now at the source link below, but if you want even more high-end stuff, you should probably wait for the ultra-slim Archos G10. It’s rumored to be 0.3-inch (7.6mm) thin, but we don’t know anything about it yet. I took my 80 back. The damn touchscreen had to be recalibrated way too often but i did receive the ICS update.